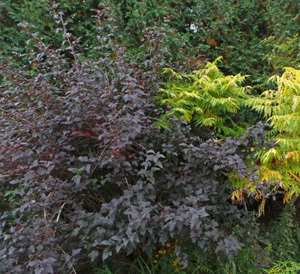 Plants with dark foliage offer contrast in the garden. 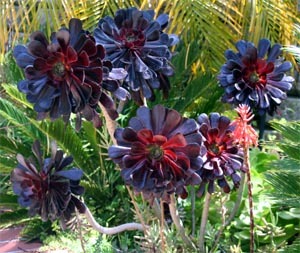 Black may be a staple in the fashion world, but isn’t quite as ubiquitous in the gardening world. 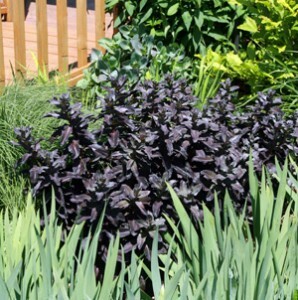 Although true-black plants are a rarity in nature, there are many dark purples, browns and greens that come close to black, and dark cultivars are being introduced at an increasing rate. Most gardens are a sea of green with flowers providing color and foliage offering contrast with different textures. 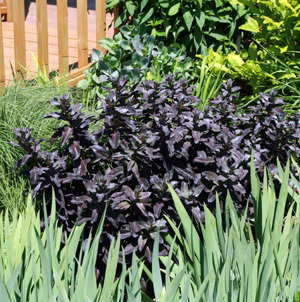 Mixing in plants with dark-colored foliage can really make a difference in the landscape or containers. 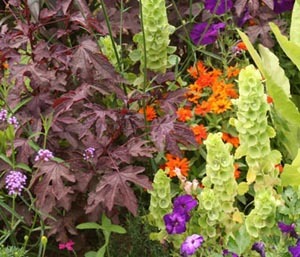 Of course plants with purple leaves make a great contrast with plants with lighter foliage for visual interest, but dramatic designs can be created with all dark-leaved plants for a very unusual effect. Purple foliage pairs well with brightly colored flowers. Dark foliage shows up best in full sun; dark plants in the shade tend to disappear, so it is best to limit their use in shady spots. Incorporating woody plants with dark foliage can create a nice backdrop for other plants and flowers or to add tend to be usually best used as accent plants where they can be viewed up close, but can also be used as a focal point to highlight other colors in the garden. 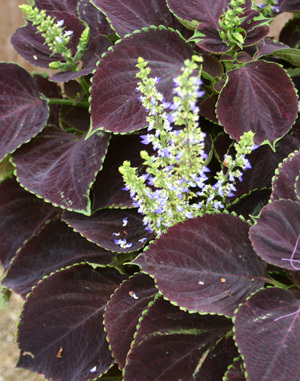 Purple foliage combines well with any other colored foliage, including blue, gold and silver, for even more contrast. Putting a plant with dark purple leaves near another with bright chartreuse leaves makes the lighter color really pop. Variegated plants are more striking beside darker colors. Flowers with strong, saturated colors tend to enhance purple foliage, and hot colors really make a statement against the dark leaves which balance their shocking shades. Pairing dark foliage with pastel flower colors add a degree of sophistication and elegance. In a moon garden dark-colored plants add contrast to the silver foliage and white flowers during the day, but at night they virtually disappear so the white pops even more. 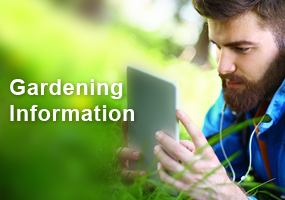 There are a plethora of plants – including annuals, herbaceous perennials, and trees and shrubs for nearly every growing condition – with cultivars that offer a change from green. Colors range from nearly true black to bright red, and every shade of purple, maroon, and brown in between. 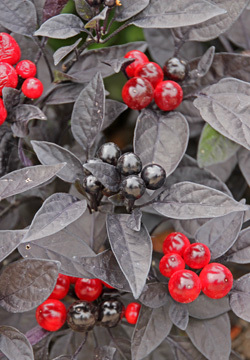 An ornamental pepper with black leaves and red fruit. 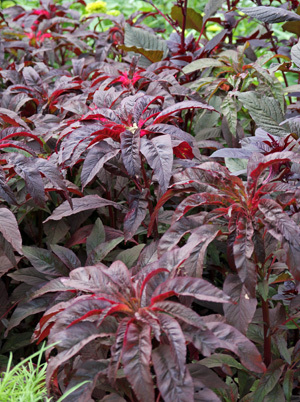 Many types of Amaranthus have dark foliage, including ‘Hopi Red Dye’ and ‘Early Splendor’ among others, but most tend to lean more toward the red than purple range of colors. 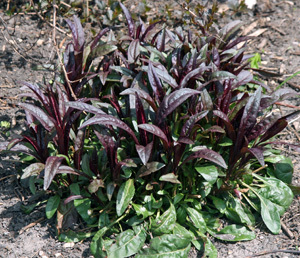 Purple cultivars of basil (Ocimum basilicum), such as ‘Opal’ or ‘Purple Ruffles’ have purple to black leaves. Ornamental pepper (Capsicum annuum) such as ’Black Pearl’ and ‘Purple Flash’ have dark foliage and purple-black fruits. 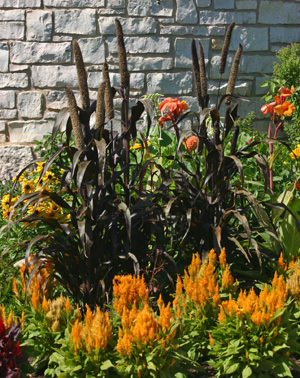 Pennisetum glaucum ‘Purple Majesty’ is a tall ornamental millet with dark purple leaves that offers vertical interest. Beefsteak plant (Perilla frutescens) is an herb in the mint family with ruffled purple with a peppery-basil smell. It can self-sow prolifically if allowed to flower. ‘Purple Majesty’ provides drama in the garden for both color contrast and vertical interest. There are many cultivars of castor bean, with ornamental types selected for different leaf color and plant height. Several cultivars of castor bean (Ricinus communis) have bronze-red or purple leaves, including ‘Carmencita Bright Red’, ‘New Zealand Purple’, and ‘Red Spire’. Tropical-looking Canna spp. 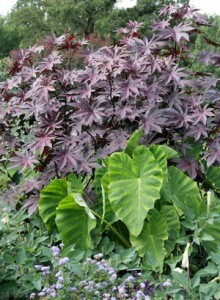 usually have wide, green leaves, but some cultivars, such as ‘Tropicanna Black’ and ‘Wyoming’ have solid purple leaves. 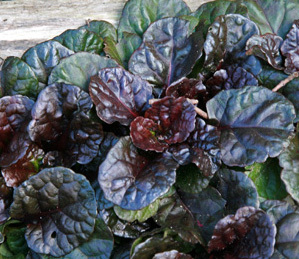 ‘Black Knight’ has black and green leaves with garnet red flowers. ‘Red Wine’ is a dwarf cultivar with vivid red flowers atop dark-burgundy stems and leaves. ‘Phaison’ has variegated leaves that start out intense purple but become striped with green, yellow, pink, and red. 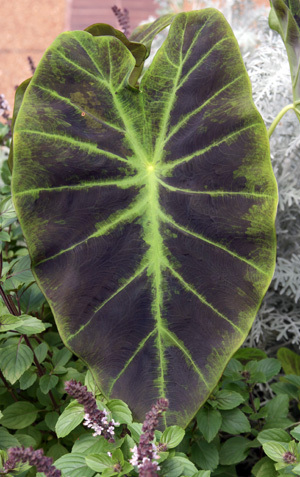 Some varieties of elephant’s ear (Colocasia esculenta) have dark foliage, such as ‘Black Magic’ with matte-black, two-foot long leaves and ‘Illustris’ with 18-inch leaves of grey-black highlighted with lime green veins and edges. Hibiscus acetosella ‘Panama Red’, ‘Red Shield’, and others (perennial in zones 8-10) is grown primarily for its striking dark purple-red, serrated leaves rather than its wine colored flowers. The dahlia ‘Bishop of Llandaff’ has dark mahogany foliage and garnet-red flowers. ‘Fascination’ has dark foliage and lilac semi-double flowers with yellow stamens. 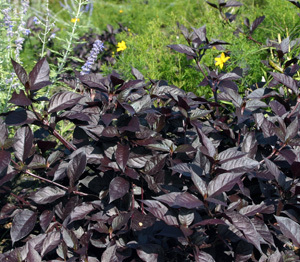 Many other cultivars are offered with dark foliage ranging from brown to purple to black. ‘Blackberry Heart’ sweet potato vine. 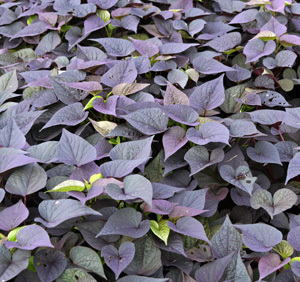 Several cultivars of sweet potato vine, Ipomoea batatas, have dark foliage. 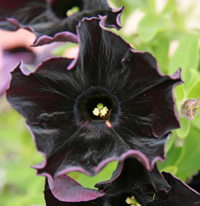 ‘Blackie’ has heart-shaped, deeply notched ebony leaves, while ‘Midnight Lace’ had sharply lobed, glossy purple-black leaves. Many other cultivars also have dark foliage. Oxalis regnelli var. triangularis (often offered as O. triangularis) has purple shamrock-shaped leaves and small pink flowers. It is often sold as a houseplant, but can be used as a seasonal plant in the ground (zones 8-11). Pennisetum purpureum ‘Princess Molly’ is a purple-foliaged grass (zones 8-10). Purple fountain grass (Pennisetum setaceum) forms clumps of deep purple foliage topped by fluffy light-catching seed-heads. Various cultivars are available. There are numerous cultivars of coleus (Solenostemon spp.) 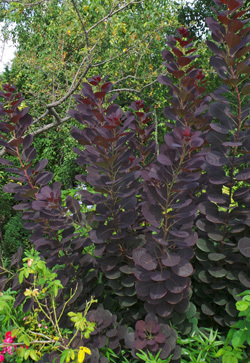 with dark foliage ranging from red to very dark purple, in solid colors or variegated in a variety of patterns. Some examples include ‘Black Lace’, ‘Dark Star’, ‘Fishnet Stockings’, ‘Inky Fingers’, ‘Merlot’, ‘Othello’, ‘Purple Emperor’ or ‘Red Ruffles’. A mass planting of Strobilanthes dyerianus. 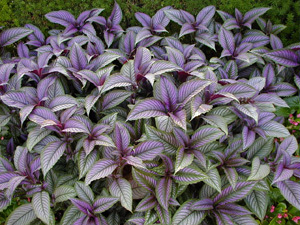 Persian shield (Strobilanthes dyerianus) has glossy, pointed dark maroon to purple leaves with colorful veining and a silver sheen to the foliage (zone 10, root hardy maybe to zone 8). The tender succulent Aeonium arboreum ‘Schwartzkopf’ or ‘Zwartkop’ (and various other spellings) has a rosette of glossy leaves so dark purple they appear black (zones 9-10). Many cultivars of the tropical perennial Alternanthera dentata (zone 10), such as ‘Purple Knight’ are noted for their rich purple to burgundy leaves. Aguja reptans ‘Black Scallop’ forms a low carpet of rounded, glossy, purple-black leaves, especially intensely colored in full sun (zones 3-9). ‘Burgundy Glow’, ‘Purple Brocade’, and others also have purple or purple-tinged foliage. Actaea (=Cimicifuga) simplex ‘Hillside Black Beauty’, ‘Brunette’, and other seelcted cultivars have large astilbe-like leaves of purple black, and pink bottlebrush flower spikes in early fall (zones 3-9). Japanese parsley (Cryptotaenia japonica atropurpurea) has ruffled purple-black foliage and stems and umbels of tiny white flowers in summer (zones 5-8). Eupatorium rugosum ‘Chocolate’ produces mounds of dark bronze-purple leaves with deep purple stems that are a big contrast to the clusters of small white flowers in fall (zones 3-7). 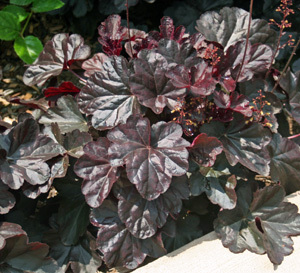 Many Heuchera and Heucherella cultivars have purple foliage, including ‘Amethyst Myst’, ‘Bressingham Bronze’, ‘Chocolate Veil’, ‘Obsidian’, ‘Plum Pudding’ or ‘Palace Purple‘, and many others (zones 4-9). Penstemon digitalis ‘Huskers Red’ in spring. A purple-foliaged tall Sedum nestles amid green foliage. The new foliage of Penstemon digitalis ‘Husker Red’ is purple, especially in spring (zones 3-8). 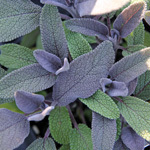 A few cultivars of culinary sage (Salvia officinalis) have darker foliage. There are a number of Sedum varieties with purple foliage, including ‘Bertram Anderson’, ‘Matrona’, ‘Morchen’, and ‘Vera Jameson’ (zones 2/3-9). Trifolium repens ‘Atropurpureum’ (also called ‘Pentaphyllum’ or Dark Dancer™) has foliage that is three or four-leaved, dark purple-red with a green margin (zones 4-9). 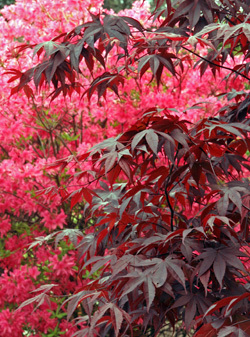 The dark foliage of ‘Bloodgood’ Japanese maple against pink azalea. Japanese maple, Acer palmatum ‘Bloodgood’ and ‘Emperor II’, have dark maroon foliage in spring and summer that turns crimson in the fall. Most cultivars of Japanese maple are not reliably hardy in most of Wisconsin, other than these two which are rated as zones 4-8. Other less hardy cultivars can be grown as container plants to overwinter in a protected area. Purple Leaf Sand Cherry, Prunus x cisterna, is an upright deciduous shrub that can be trained as a small tree. It has reddish purple foliage that retains good color throughout the summer (zones 2-8). Smokebush or smoketree (Cotinus coggygria) ‘Royal Purple’, is an upright, multi-stemmed, deciduous shrub or small tree with dark red-purple leaves that turn scarlet in fall (zones 5-9). 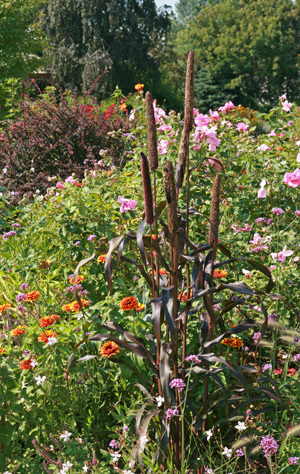 ‘Velvet Cloak’ is another cultivar with deep purple foliage that turns orange-red in autumn. Eastern ninebark (Physocarpus opulifolius) ‘Diabolo’ or ‘Diablo’, has deep burgundy foliage that becomes almost black by midsummer and clusters of pink-tinged white flowers in late spring (zones 3-7). Weigela florida Wine and Roses® is a deciduous shrub with reddish-pink flowers in spring and purple foliage (zones 4-8). Aquilegia vulgaris var. stellata ‘Black Barlow’, a columbine that was bred especially for cut flower production, with fully double, purplish black, spurless blossoms that resemble small dahlias. Iris chrysographes, with reddish violet to dark violet flowers. ‘Black Parrot’ and ‘Queen of Night’ are some of the “black” tulips that are really a deep purple. Viola ‘Bowles Black’ has velvety purple flowers, as do other cultivars such as ‘Black Moon’ and‘Black Prince’. ‘Black Forest’ calla (Zantedeschia aethiopica) has shiny, deep purple flowers with dark red edging. what is the plant with thin dark leaves and small bright red flowers called? I have one and i have trouble finding the name . I love purple/black sedum and have several different ones in my garden! I also have some different types of medium green sedum that have a nice reddish/purple tinge on the edges of the leaves, but over time, they seem to fade to mostly just green. Anyone know – is there something I can do (fertilizing, etc) that will help bring out the reddish/purple color in those sedum? Would love to amp up that nice accent color on them if I can! Thanks! Hello – People concerned about the environment and the future of our birds, butterflies and other beneficial insects will eschew purple leaved nativars (cultivars of native plants). Changing a native plant’s leaves from green to purple produces chemical changes that prevent caterpillars and other larva from eating and digesting the purple vegetation. This produces a scarcity of beneficial insects like butterfly caterpillars and specialists like the ninebark calligraphy beetle, which 96% of nesting birds must have to feed their offspring. (Most bird nestlings do not eat fruit or seeds, only insects.) Planting for strictly ornamental reasons – and ignoring the needs of our beloved butterflies and birds – is short sighted because it leads to endangerment and extinction of our at-risk wildlife. This website should take relevant environmental issues into consideration instead of dwelling of short term ornamental benefits. I recently began gardening, and had an “oh duh” moment about a month ago, pulled up the annuals I’d bought from a supplier that uses neonics — AFTER a really patient and well-informed commenter on FB took the time to educate me about pollinator conservation. And foliage color? Never would have occured to me. Many of us are well-intentioned but ignorant. The good thing is, when we know better, we do better. Thank you for taking the time to put this information out here for amateurs like myself. I have the Eastern Ninebark Diablo and often get powdery mildew on it. Ruins the looks of the dark foliage. I have been using Purple Fountain grass and looking for other interesting dark foliage plants. This article gave me a lot of good ideas. 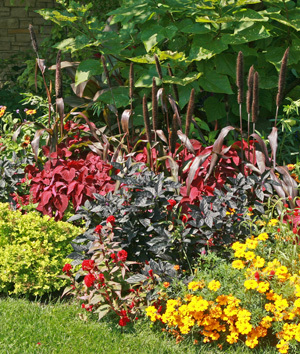 I have always been a fan of mixing colors–light and dark–in the gardens, but really hadn’t thought of using some of the plants from other zones as “annuals” to add to the mix or including trees and shrubs. Thanks for all the great ideas and information. Good ideas in color mixes to break away from the more common color schemes in window boxes, and planters. I like adding a little drama in my arrangements! I have a very large plant with green leaves and a large horn looking thing grows from center and gives off horrible smell. I’m interested to know what the name of it is. 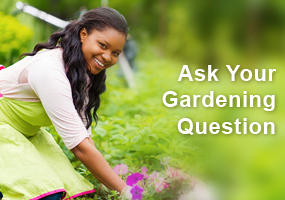 This is not really a forum for answering general gardening questions. 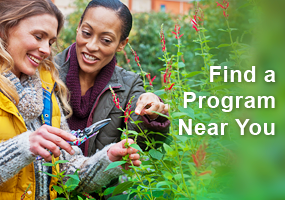 Please contact your local county UW-Extension office (http://counties.uwex.edu/) for plant ID questions. That sounds like Dracunculus vulgaris – or Dragon Flower. Beautiful but smells horrific.